, an eminent statesman and dean of Canterbury, was, as we have already noticed, grand uncle to the preceding sir Henry. 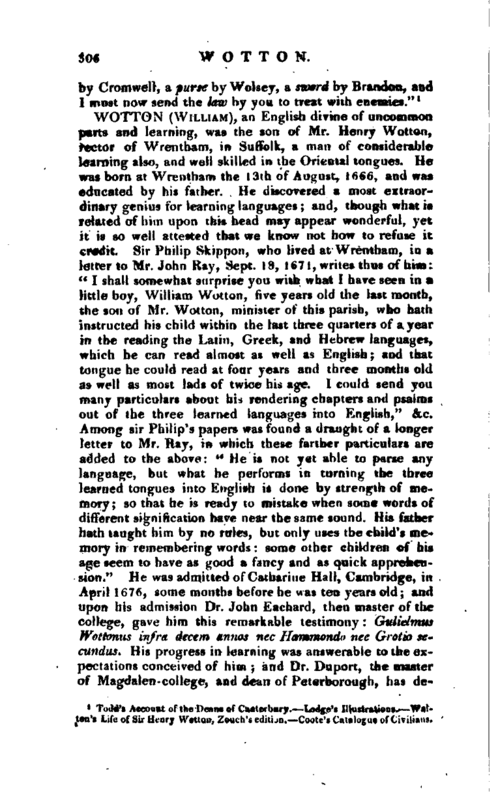 He was the fourth son of sir Robert Wotton, knt. by Anne Belknapp, daughter of sir Henry Belknapp, knt. and was born about 1497. He was educated in the university of Oxford, where he studied the canon and civil law, his skill in which recommended him to the notice of Tunstall, bishop of London, to whom he became official in 1528, being at that time doctor of laws. Having entered into the church, he was collated by archbishop Warham to the rectory of Ivychurch in the county of Kent. But this benefice he resigned in 1555, reserving to himself a pension of twenty-two marks, one third of its reputed value, during his life. He continued to act as a civilian; and in 1536, when sentence was pronounced upon Anne Boleyn, he appeared in court as her proctor. In 1538 archbishop Cranmer constituted him commissary of his faculties for the term of his natural life. About the same time he became chaplain to the king, who in 1.539 nominated him to the archdeaconry of Gloucester, then vacant by the promotion of archdeacon Bell to the see of Worcester. His next promotion was to the deanery of Canterbury in 1541; in addition to which he obtained in | 1544 the deanery of York, and was the only person who ever possessed at the same time the deaneries of the two metropolitan churches. In 1545 he was presented to the prebend of Osbaldwick in York cathedral. In 1553 he resigned the archdeaconry of Gloucester, and was presented in 1557 to the treasuryship of the church of Exeter, which he also relinquished the succeeding year. 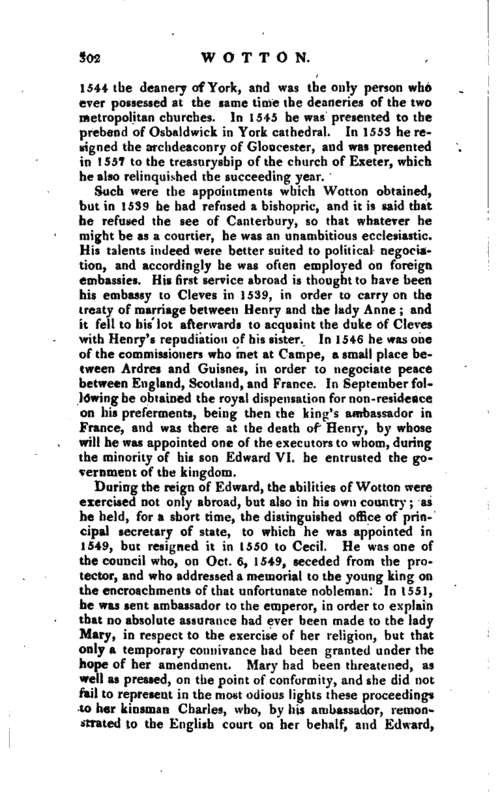 Such were the appointments which Wotton obtained, but in 1539 he had refused a bishopric, and it is said that he refused the see of Canterbury, so that whatever he might be as a courtier, he was an unambitious ecclesiastic. His talents indeed were better suited to political negociation, and accordingly he was often employed on foreign embassies. His first service abroad is thought to have been his embassy to Cleves in 1539, in order to carry on the treaty of marriage between Henry and the lady Anne; and it fell to his lot afterwards to acquaint the duke of Cleves with Henry’s repudiation of his sister. In 1546 he was one of the commissioners who met at Campe, a small place between Ardres and Guisnes, in order to negociate peace between England, Scotland, and France. In September following he obtained the royal dispensation for non-residence on his preferments, being then the king’s ambassador in France, and was there at the death of Henry, by whose will he was appointed one of the executors to whom, during the minority of his son Edward VI. he entrusted the government of the kingdom. During the reign of Edward, the abilities of Wotton were exercised not only abroad, but also in his own country; as he held, for a short time, the distinguished office of principal secretary of state, to which he was appointed in 1549, but resigned it in 1550 to Cecil. He was one of the council who, on Oct. 6, 1549, seceded from the protector, and who addressed a memorial to the young king on the encroachments of that unfortunate nobleman. In 1551, he was sent ambassador to the emperor, in order to explain that no absolute assurance had ever been made to the lady Mary, in respect to the exercise of her religion, but that only a temporary connivance had been granted under the hope of her amendment. Mary had been threatened, as well as pressed, on the point of conformity, and she did not fail to represent in the most odious lights these proceedings to her kinsman Charles, who, by his ambassador, remonstrated to the English court on her behalf, and Edward, | prevailed upon by his council, sent Wotton to continue a good correspondence with his imperial majesty. At the death of Edward, Wotton, sir William Pickering, and sir Thomas Chaloner, were ambassadors ifi France, whence they wrote to Mary on her accession to the throne, acknowledging her queen, and ceasing to act any further in their public character. But in this capacity she thought proper to continue Wotton, with whom she joined sir Anthony St. Leger. From France the dean is said to have written to the queen in 1553, on the following subject. 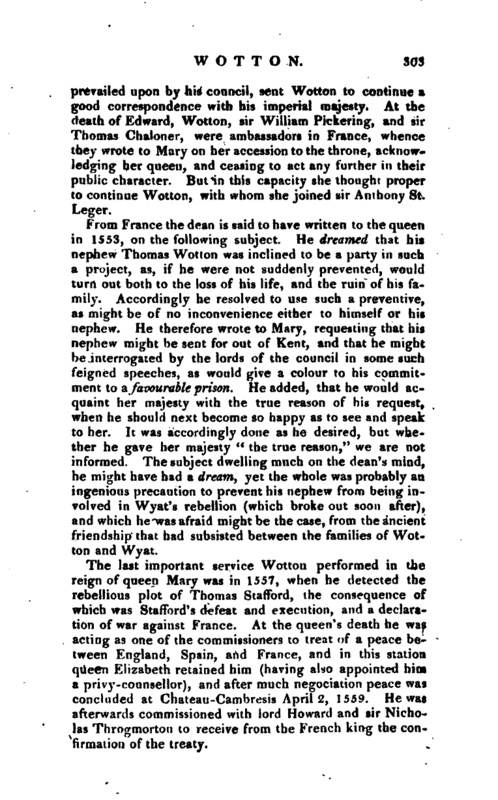 He dreamed that his nephew Thomas Wotton was inclined to be a party in such a project, as, if he were not suddenly prevented, would turn out both to the loss of his life, and the ruin of his family. Accordingly he resolved to use such a preventive, as might be of no inconvenience either to himself or his nephew. He therefore wrote to Mary, requesting that his nephew might be sent for out of Kent, and that he might be interrogated by the lords of the council in some such feigned speeches, as would give a colour to his commitment to a favourable prison. He added, that he would acquaint her majesty with the true reason of his request, when he should next become so happy as to see and speak to her. It was accordingly done as he desired, but whether he gave her majesty “the true reason,” we are not informed. The subject dwelling much on the dean’s mind, he might have had a dream, yet the whole was probably an ingenious precaution to prevent his nephew from being involved in Wyat’s rebellion (which broke out soon after), and which he was afraid might be the case, from the ancient friendship that had subsisted between the families of Wotton and Wyat. The last important service Wotton performed in the reign of queen Mary was in 1557, when he detected the rebellious plot of Thomas Stafford, the, consequence of which was Stafford’s defeat and execution, and a declaration of war against France. At the queen’s death he was acting as one of the commissioners to treat of a peace between England, Spain, and France, and in this station queen Elizabeth retained him (having also appointed him a privy-counsellor), and after much negociation peace was concluded at Chateaif-Camhresis April 2, 1559. He was afterwards commissioned with lord Howard and sir Nicholas Throgmorton to receive from the French king the confirmation of the treaty. | This peace, however, was of short duration. The ambitious proceedings of the French court in 1559, and the success of their arms against the Scotch protestants, were sufficient to excite the vigilance of Elizabeth. Her indignation at the claim of Mary (queen of Scots) to the English crown, a claim which the French hoped to establish, and the declining affairs of the reformers who solicited her assistance, at length determined her to send a powerful force to Scotland. In the event of this quarrel the French were obliged to capitulate, and commissioners were appointed to treat of peace. Those on the part of England were dean Wotton and sir William Cecil; on that of France, Mouluc bishop of Valence, and the Sieur de Randan. The interests of the English and French courts were soon adjusted; but to a formal treaty with the Scots, the French ambassador considered it derogatory from the dignity of their sovereign to accede. The redress of their grievances was, however, granted in the name of Francis and Mary, and accepted by the Scots, as an act of royal indulgence. And whatever concessions they obtained, whether in respect to their personal safety, or their public demands, the French ambassadors agreed to insert in the treaty with Elizabeth; so that they were sanctioned, though not with the name, yet with all the security of the most solemn negociation. 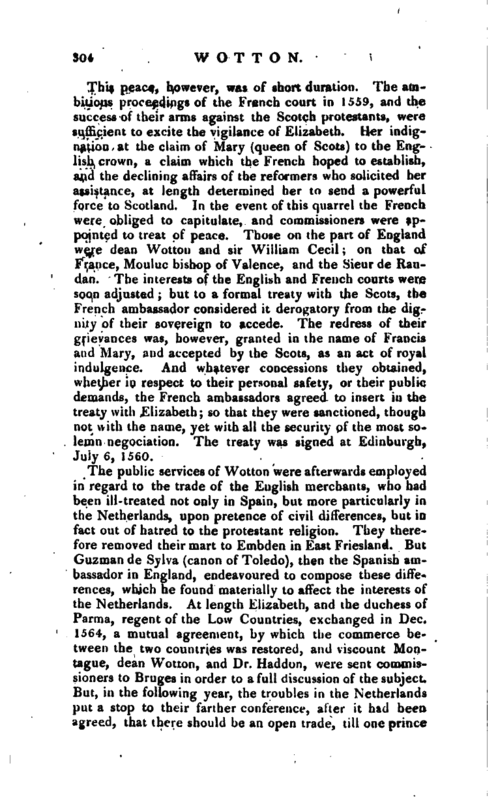 The treaty was signed at Edinburgh, July 6, 1560. The public services of Wotton were afterwards employed in regard to the trade of the English merchants, who had been ill-treated not only in Spain, but more particularly in the Netherlands, upon pretence of civil differences, but in fact out of hatred to the protestant religion. They therefore removed their mart to Embden in East Friesland, But Guzman de Sylva (canon of Toledo), then the Spanish ambassador in England, endeavoured to compose these differences, which he. found materially to affect the interests of the Netherlands. At length Elizabeth, and the duchess of Parma, regent of the Low Countries, exchanged in Dec. 1564, a mutual agreement, by which the commerce between the two countries was restored, and viscount Montague, dean Wotton, and Dr. Haddon, were sent commissioners to Bruges in order to a full discussion of the subject. But, in the following year, the troubles in the Netherlands put a stop to their farther conference, after it had been agreed, that there should be an open trade, till one prince | denounced war against the other; and in that case, the merchants should have forty days notice to dispose of themselves and their effects. This was probably the last employment of the dean, which indeed he did not long survive. He died at his house in Warwick-lane, Jan. 25, 1566, aged about seventy, and was interred in Canterbury cathedral, in the chapel of the Holy Trinity, where is a beautiful and much admired monument, part, if not the whole of which, was executed at Rome. He is represented kneeling at his devotions; the head is said to have been carved by his own order, while living. Over his figure is a very long Latin inscription, containing many particulars of his life. As he died unmarried, he left his nephew Thomas Wotton his heir. 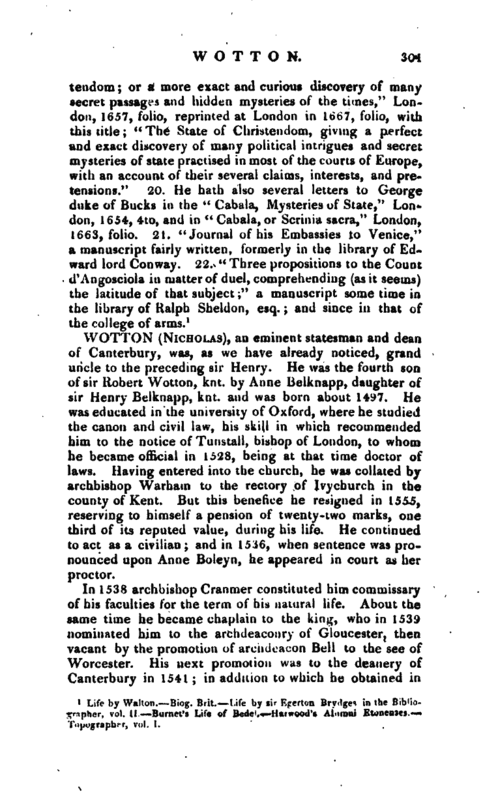 Todd’s Account of the Deans of Canterbury. Lodge’s Illustrations. 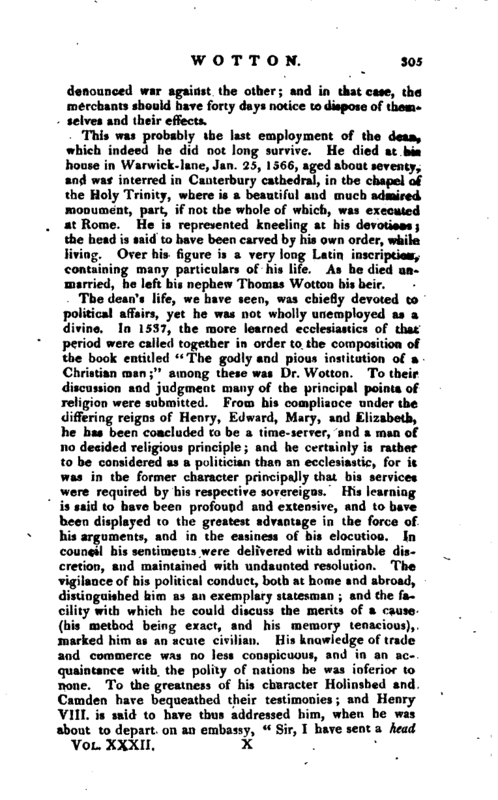 Watton’s Life of Sir Henry Wotton, Zouch’s edition. Coote’s Catalogue of Civilians.